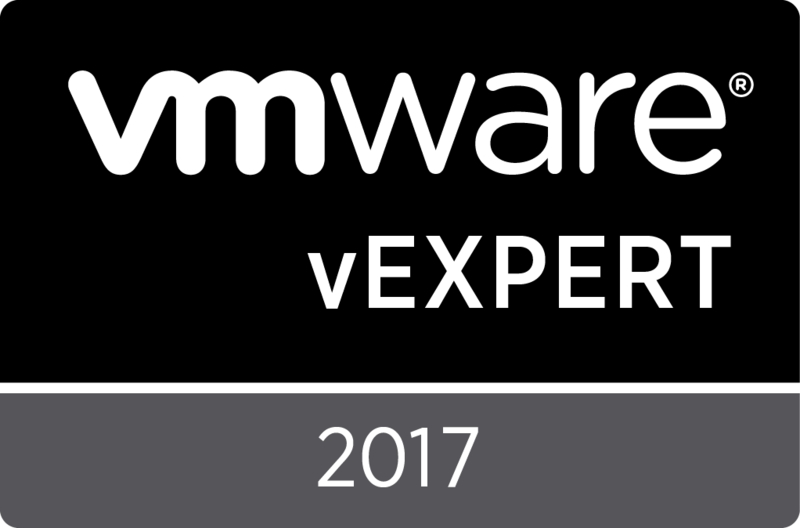 Starting from VMworld US 2017, VMware announced their plans to support PSC replication and Enhanced Linked Mode with the vCenter Embedded deployment model, simplifying overall deployment and management requirements for a multi-vCenter environment. This feature is now included in the release of vSphere 6.7. In this post, I go over a little history for common deployment models, as well as what the new “vCenter Embedded Linked Mode” brings to the table. I also compare a couple of topologies between vSphere 6.0/6.5 and vSphere 6.7 to show the savings in the amount of nodes and in some cases, the complexity, that can be saved by using this new deployment topology. 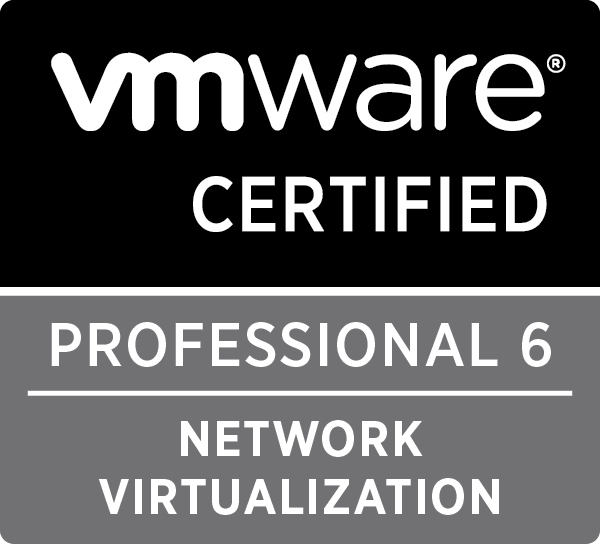 If you are really familiar with vCenter 5.5, 6.0 and 6.5 topologies, it might be worth skipping this section. In 5.5, there was an a technology named Linked Mode. Enabling Linked Mode places all vCenter Server instances running the same version into a Linked Mode group and provides a centralised management view of all linked vCenter Server instances. It also replicates the roles and permissions between vCenter Server instances. It’s fair to say that Linked Mode is easy to set up in 5.5 and is very popular. There are two models in which vCenter 6.0 / 6.5 can be deployed; Embedded or External. 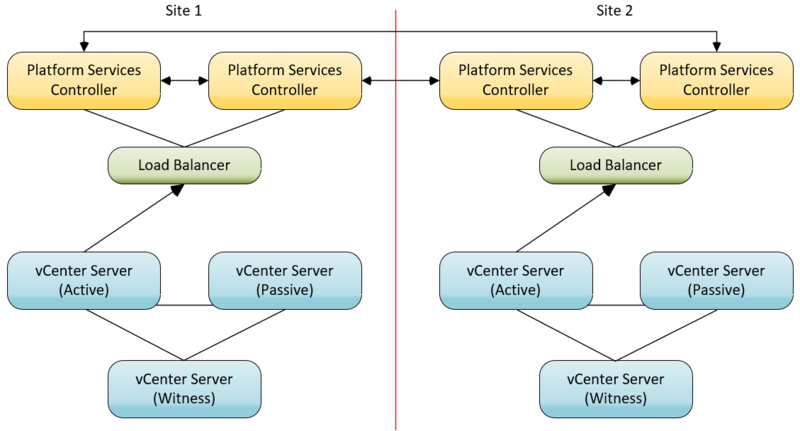 An embedded deployment means the PSC and vCenter Server roles are installed on a single server. The embedded deployment model is easy to deploy and maintain, and multiple standalone embedded deployments are supported in a single environment. The down side is that an embedded deployment cannot replicate to another embedded deployment, and Enhanced Linked Mode is not supported. 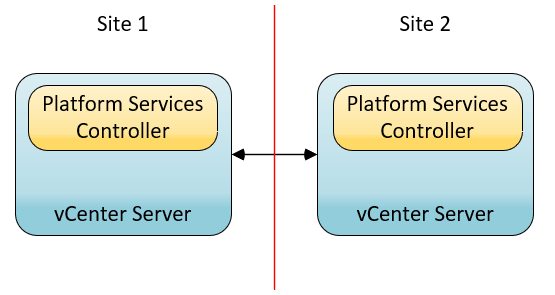 An external deployment means the PSC is deployed on a single server, and then the vCenter Server is installed on a separate server, which then links to a PSC server. 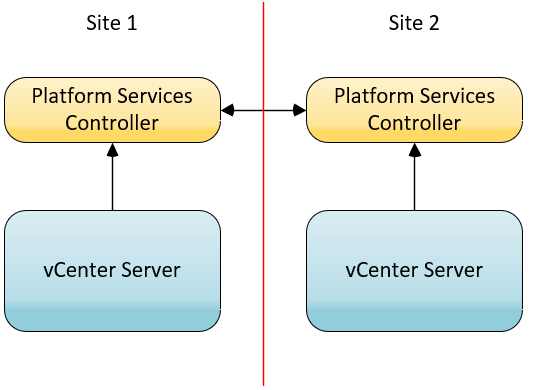 Multiple vCenter Servers can link to a single PSC. External PSC servers replicate with other external PSC servers in the same vSphere SSO domain. External PSC servers can also be load balanced for high availability, albeit at the cost of complexity. By going down the path of an external deployment, Enhanced Linked Mode is automatically enabled, meaning you can manage all vCenter Servers in the vSphere SSO domain from a single vSphere Web Client session. Deciding if you need Enhanced Linked Mode is the primary driver to determine if you should go down the path of an embedded or external deployment model (but do note this isn’t the only deciding factor). With the release of vSphere 6.7, the vCenter Server Appliance now has support for an embedded deployment (vCenter Server and PSC on the same node) to be connected with other embedded nodes with what is being named Embedded Linked Mode (yep, still got the ELM acronym! ), which allows you to log in and manage all vCenter Servers that are linked within the same SSO domain in a single browser session. As of this release, VMware are supporting up to 15 embedded nodes to be connected in Embedded Linked Mode. If your environment scales beyond that, then this is a reason to stick with the external model, which is still supported in 6.7. There is also full support for Embedded Linked Mode when using the vCenter HA and vCSA backup and restore features. Unfortunately at this point in time, there is no single script or tool that can migrate your current external deployment back to an embedded deployment, so for those that have already gone down the path of an external model, getting back to embedded won’t be so straight forward. The only option you really have currently is to spin up a new environment with the embedded model and migrate your configuration, hosts and virtual machines across to the new deployment. You’ll need to weigh up if the effort required in going down this path is going to pay off for you and your desired deployment and requirements. Here’s hoping VMware are working on a tool to simplify this process! Ok, so you like the deployment model, how do you actually go about deploying it? Well, the good news is that if you’ve deployed vCenter Server with 6.0 or 6.5, the process is really no different. You have the options of the GUI based deployment and my preferred option, the CLI based deployment. When you get around to deploying your second embedded vCenter Server and you want to use Embedded Linked Mode, you simply just specify the first node you deployed as the replication partner. If you end up deploying more than two nodes, remember that the guidance from VMware is to create a ring replication topology between PSC nodes, and this still applies to this new embedded deployment topology. If you look at the VCSA CLI deployment JSON templates (located in \vcsa-cli-installer\templates\install on the media), we can see two new templates to use for deploying the second or later embedded VCSA replication nodes to either ESXi or vCenter Server. So you would use on of the first two templates for the deployment of your first node, and then one of the second two templates for subsequent nodes, depending on your deployment target (to ESXi to VC). 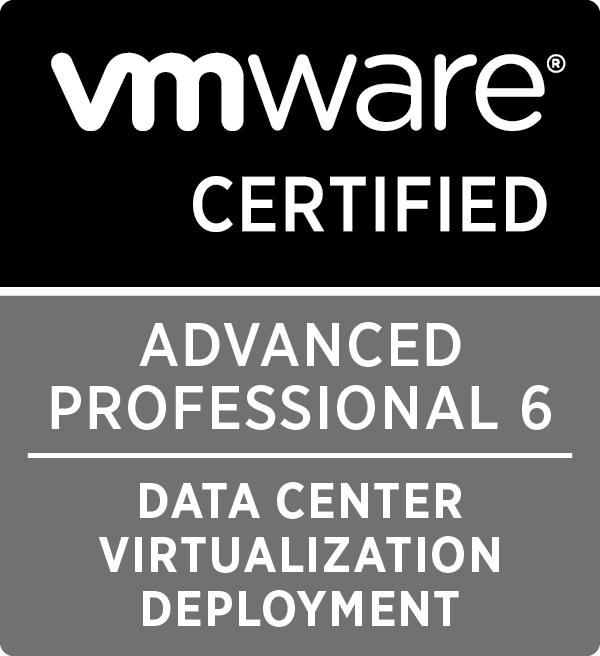 I hope this post was helpful to you and you now understand the new Embedded Linked Mode deployment mode that is available in vSphere 6.7.
hello, I have 17 vcenter servers distributed geographically all of them with vSphere Essentials license. If I upgrade to 6.7, Would it be possible to configure 15 of them in embedded linked mode with these licenses? According to the following article, Enhanced Linked Mode (and therefore likely Embedded Linked Mode) is not supported with vCenter Server Foundation or vCenter Server Essentials. Is there in the meanwhile a plan to migrate our current external deployment back to an embedded deployment? Does anyone have any idea about the plans of vmware? This is a big pain point at the moment. Unfortunately there is no tool available yet from VMware to collapse and external deployment to an embedded deployment. VMware have publically stated they are working on it, but obviously with no commitment to time frames. Thanks Matt. Any updates on this? Any ideas when they will make a Sphere 6.7 Topology and Upgrade Planning Tool? I have two vcenter already deployed, can we make/enable linked mode?